We are dedicated to developing and maintaining strong working relationships with referring health care providers and to making the referral process as efficient as possible. Whether you would like to seek a second opinion, transfer a patient or check on your patient’s status, we’re here to serve you. We recognize the importance of the relationship that you have with your patient and will honor that relationship by providing you with enhanced accessibility and communication. The Access Center at UW Hospital and Clinics in Madison can assist you in handling all issues surrounding emergency patient admissions and referrals. 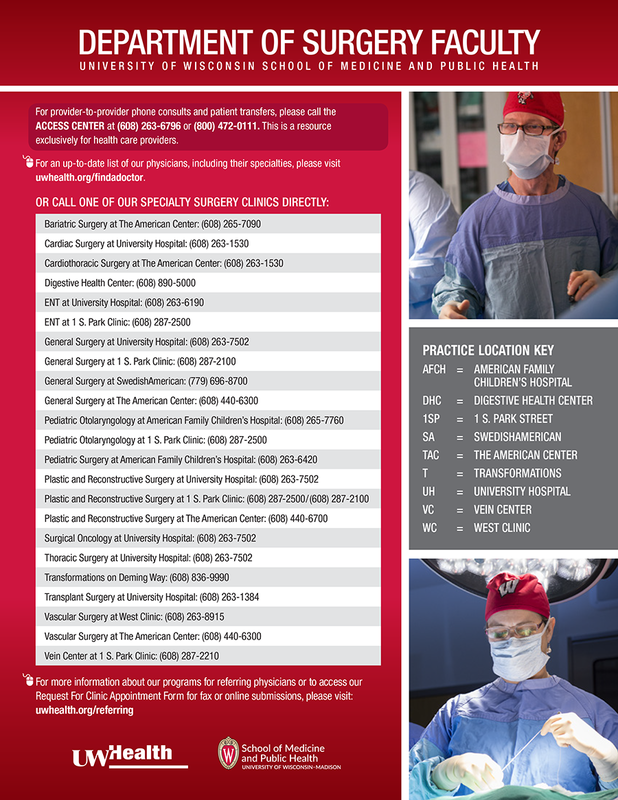 Our Referring Provider Service will help you schedule an appointment at any of our 80 different specialty clinics. Our Provider Relations Coordinator is a hospital-based advocate for referring providers, their staff, referral coordinators and health plan staff. UW Health ImageShare is a complementary service designed to expedite image sharing between UW Heath and partnering organizations. We’re proud to offer a variety of continuing education options for practicing providers.